A Newborn Baby Plaque To Welcome The New Baby. If you have a newborn baby in the family, this plaque will be a welcome gift to the new mother on the birth of her child. 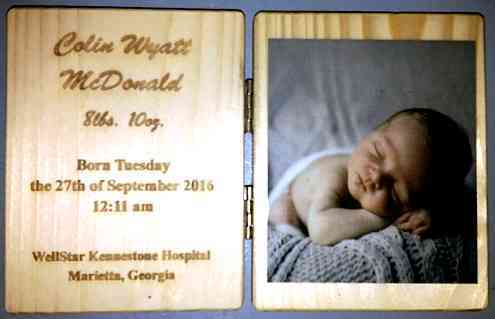 Laser cut to your specifications, these plaques will be a cherished memory for the family. Photo is not included. All our plaques are made of recycled white pine, edges eased, sanded smooth, and finished with at least 2 clear finish coats. All plaques have solid brass hinges. You attach your own picture using rubber cement.